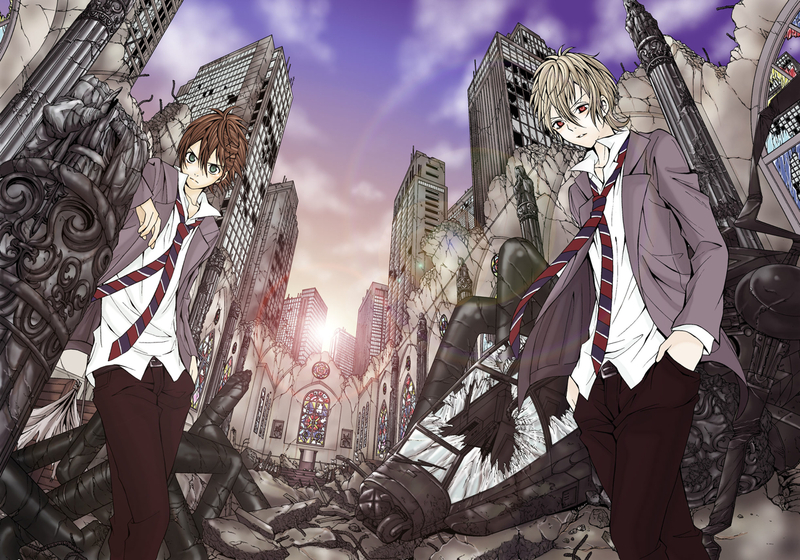 The Civilization Blaster (Zetsuen no Tempest) is the story of Yoshino and Mahiro, and the troubled friendship they share over the death of Mahiro's sister, Aika. Mahiro is recruited by Hakaze, the self-proclaimed 'most powerful wizard alive' to stop renegade wizards within her own clan from resurrecting the Tree of Exodus and destroying the world. Harnessing the power of the Tree of Genesis, Hakaze shares that power with Mashiro through the use of silver talismans, allowing him to use magic and hunt down the man who murdered his sister. While there are no connections as yet made to the story of his sister's murderer, and the Tree of Exodus, it can be assumed that, in time, one might well have something to do with the other. 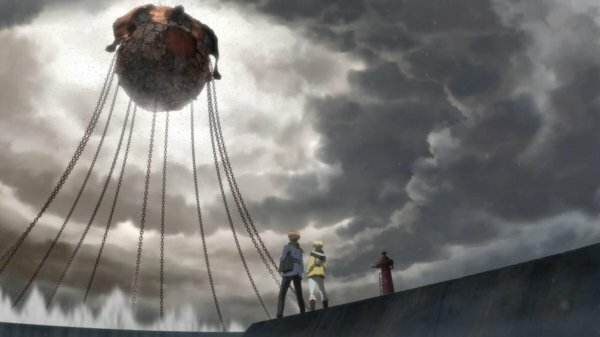 What is interesting to note is the connections the writers made between the anime and Shakespeare, going as far as quoting Hamlet in the first episode, and if you compare the story of Hamlet and that of Mahiro hunting his sister's murderer, you can well see that Hamlet served as inspiration. Another side to the story is the romantic relationship Yoshino had with Aika, which for reasons unknown, was kept secret from Mahiro. Add a third, unkown party that is for some unknown reason hunting down Mahiro, and you have a plot with many intricate strands that manage to effectively tie together into an intriguing and deep storyline. 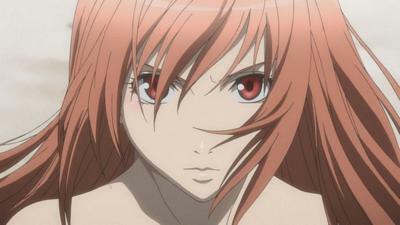 The first episode sees Yoshino reunited with Mahiro, after Mahiro takes a long absence from school following the death of Aika. Upon his return, an apocalyptic spell is unleashed when a "fruit" - which is part of the Tree of Exodus - is awakened, causing everyone in the city to turn to stone. 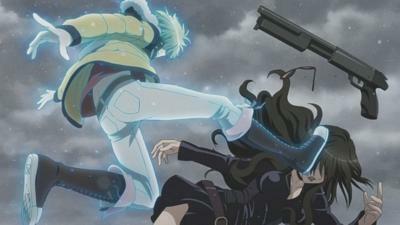 Mahiro is protected from the spell by the magic bestowed upon him by Hakaze, and because of Yoshino's proximity to him, he is also spared the effects. They are now forced to flee the city, avoiding wizards and those hunting them, before the government can quarantine the city and trap them within. A word of warning though, the first episode skips back and forth through time, and while it shows some good character depth and background, it can be at times confusing figuring out what exactly is going on because the show gives no indication that it has infact gone back in time. Fortunately, from the second episode on we are treated to a serialized story that continues to grow stronger as the episodes continue. The show reminded me of Guilty Crown, which was an incredible anime with a story so unpredictable that it would keep you guessing until the very last episode. I suspect The Civilization Blaster might manage to repeat some of that amazing storytelling that Guilty Crown had. So far there are so many different stories going on in the plot that there can be no knowing what might come next. Just finished the epic mid-season finale of The Civilization Blaster. The unexpected plot twists of this show have been staggering, and I can only hope that as we wait for the show's return in the new year, that there will be many more surprises in store for us. I can count the number of anime on one hand that have kept me guessing like this show has.